How would you do this??? My son wants me to help him go into the wooden earring business via an Etsy page. He wants me to make various shapes. Trying to figure out the best way to make them. The round ones are easy to make with a plug cutter but I need some sort of production setup, especially for the different shaped ones. Cheap Chinese laser CNC? But don’t want a huge investment as he can’t really afford it so I’ll have to front the $ to get him started. Round, square, hex, diamond, etc. Then slice off the buttons. Have him take a look at the number of stores on Etsy selling earrings, then wooden ones. My guess is he might find it a bit daunting. 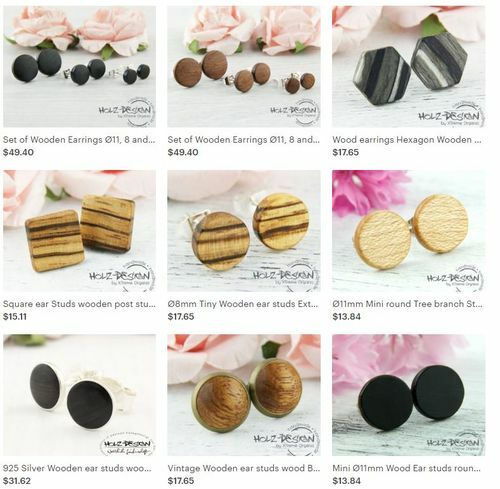 Six separate categories of wooden earrings. 60 items displayed per page. Hundreds of dealers, if not thousands. Das a lot of earrings! I would not spend much of anything trying to compete on Etsy. There’s inevitably going to be some Chinese seller making whatever you’re making at a fifth the cost and selling it for half what you can sell it for. Etsy is not a way to make a living. EXCELLENT! Thanks. That gives me some ideas. Turn the round ones on the lathe. Slice the rods like carrots on the band saw. Yeah, me too. I’m thinking that once I get them cut I’m gonna try putting them in a tupperware container filled with sand, wrap that in bubble wrap and let it tumble in the dryer for a while. I would not spend much of anything trying to compete on Etsy. There s inevitably going to be some Chinese seller making whatever you re making at a fifth the cost and selling it for half what you can sell it for. If it’s “practice” for running a business, why not go for a product that is less tedious to make, like cutting boards / serving trays, or even coasters. Tedium = burnout, quickly. Wooden earrings just seems like such a niche product. Even in Portland where 1/3rd of the population seems to have their ears gaged with those huge rings and stuff, I don’t see anyone wearing wooden earrings. There may be a problem with that technique. You will end up with all endgrain showing on the earrings. Not what the samples show. If it s “practice” for running a business, why not go for a product that is less tedious to make, like cutting boards / serving trays, or even coasters. Tedium = burnout, quickly. Wooden earrings just seems like such a niche product. Even in Portland where 1/3rd of the population seems to have their ears gaged with those huge rings and stuff, I don t see anyone wearing wooden earrings. Thanks. Good point. I guess as the supplier I’m still in the R&D phase depending on what my client wants. I bet I could even use brass tubes or rods in some of them for a little variety. saw. Pop the parts off with a chisel. Cut a series of squares from your stock. Make a jig to glue and clamp the squares into a blank. Shape the blank and slice as suggested by pete724. you will then have the grain showing. If that’s the case, you may want to consider using eBay or Alibaba.com! If that s the case, you may want to consider using eBay or Alibaba.com! I would go with the advice pete724 and Davis844 gave over getting involved with a cheap CNC or laser cutter. Too much potential for frustration with a cheap unit, especially if you are also learning how to operate it. I also would not get discouraged by how flooded the market is. If he is doing this as a learning exercise that is a very real hurdle to gain experience with. If you end up with a bunch of earrings that don’t sell, turn them into cuff-links and try again. Turning a mistake into something else is part of any creative endeavor and often a rewarding one. And if not a single thing gets sold and you get quality time and memories with your son, money well spent. Loren and Davis844,(welcome to lj’s) not sure what you mean, even though I don’t have a RAS. Trying to understand.